BioWare just released the first teaser, for the next chapter of Star Wars: The old Republic – Knights of the fallen empire. 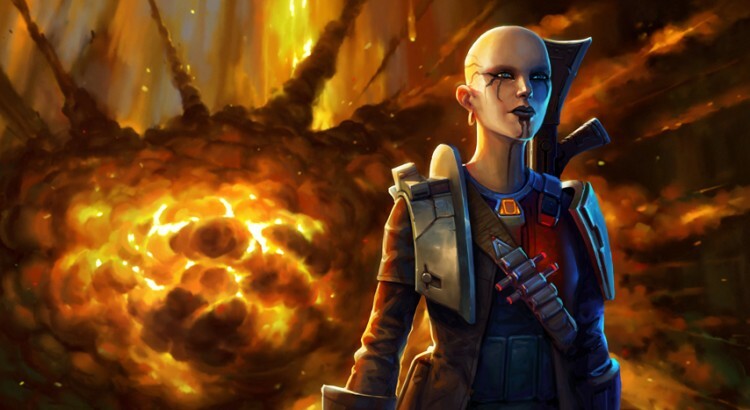 This chapter is called “Anarchy in Paradise”, the content expansion will introduce a new ally named Firebrand as well as a new story arc involving her with the express mission to destroy the Eternal Empire. The next chapter will launch on February 11th. Introducing a new ally, an infamous mercenary known as Firebrand, with a grudge against the Eternal Throne, in Knights of the Fallen Empire – Anarchy in Paradise. Get a first look at an infamous mercenary known as Firebrand and the secret plan she is putting in motion to destroy Zakuul and the Eternal Throne in the upcoming new chapter for STAR WARS™: The Old Republic™ Knights of the Fallen Empire – Anarchy in Paradise! Anarchy in Paradise will be released February 11, 2016, and is the first in an epic series of seven new chapters that build on the deep and personal story of the Outlander introduced in Knights of the Fallen Empire. In this chapter, players will begin to see the consequences of their past decisions playing out within their Alliance. Best of all, Subscribers of STAR WARS: The Old Republic can access and play all chapters of the evolving Knights of the Fallen Empire story for free. Be one of the first to play as a Subscriber! The new Subscriber Rewards Program includes 2-Day Early Access and unique in-game rewards inspired by the iconic HK-55 Assassin Droid, including HK-55 himself and his powerful Jetpack!